Donato Colavecchio first appears in the Painesville, Ohio, area in 1905. In America, Donato Colavecchio was known as Dan Colavecchio. Donato Colavecchio, son of Nicola Colavecchio and Vittoria Carderelli, was born on December 17, 1881, at Frosolone, Italy. He married Domenica Zampini, daughter of Felice Zampini and Teresa Notte, on January 10, 1907, at St. Mary Catholic Church at Painesville, Lake County, Ohio. Donato died on September 15, 1966, at Schenectady, Schenectady County, New York, at age 84. Donato Colavecchio immigrated to the United States on March 10, 1905, at age 23, travelling to Painesville, Lake County, Ohio, joining his brother, Felicantonio Colavecchio. Three of Doanato’s siblings also lived in Painesville. 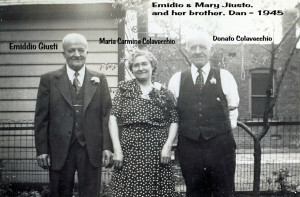 Felicantonio Colavecchio migrated to Painesville in 1904, and Maria Carmina Colavecchio in 1907, and Giuseppe Colavecchio in 1916. Donato, his wife, and children moved to Schenectady, New York in the 1910’s. His sister, Maria Carmina Colavecchio, and her family, also moved to Schenectady in 1913 or 1914. 1. Maria Victoria Colavecchio was born on November 11, 1907, at Painesville, Lake County, Ohio. 2. Donato Caterina Colavecchio was born about November, 1908, at Ohio.